The Gravity™ 2 has a traditional keypad for dialing, plus a slide-out, full QWERTY keyboard that lets you type as fast as you think. And with T9™ Predictive text, sometimes you can type faster than you think. 2.0 megapixels is more than enough to take, send and save great pictures. You can even use the multi-shot feature and 2.5x digital zoom. Want more? The Gravity™ 2 also lets you shoot video. With the help of its slide-out keyboard, the Gravity™ 2 makes messaging fast and easy. You'll be able to enjoy text messaging, instant messaging, picture messaging, video messaging, audio messaging and checking your email. The Gravity™ 2 lets you cruise the web at 3G speed. Which means you'll be able to quickly download the latest wallpapers, ringtones, games and other applications. And with landscape mode, you'll be able to get the whole picture. Why just have it all when you can have it all faster? 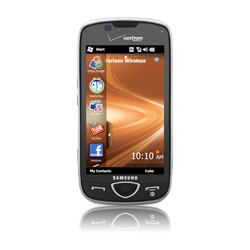 The Samsung Omnia® II has the fastest text capability of any touchscreen device so you can easily and accurately type emails, send texts or post to blogs and social sites at speeds like no other touchscreen phone. And the state-of-the-art multimedia features and breathtaking AMOLED screen technology lets you create or edit videos in stunning clarity. It also has a 5.0 megapixel camera/camcorder for vibrant photos and videos, and one of the largest wide screen displays ever at 3.7”. The Omnia® II, it's all the features you want – at the speed you need. Dimension (HXWXD) - 4.69" x 2.35" x .52"